News and insights from The Night Ministry's Associate Board. The Street Medicine Team takes health care directly to individuals who face challenges in accessing traditional medical services. It's already pushing 80 degrees early on a humid, mid-August Saturday morning when the Street Medicine van pulls up outside The Night Ministry's Ravenswood headquarters. Outreach Professional Milton Alvarez jumps out. A pair of volunteers wait for him at the front door, ready to load food, water, clothing, and hygiene kits (dental care, deodorant, soap, and the like) into the van. Water will be especially important today, with the heat index pushing into dangerous territory. At The Night Ministry office, Dr. Ralph Ryan, a veteran cardiologist and volunteer, preps a medical supply bag for the day, not knowing exactly what needs he'll encounter among his patients. He can make a fair bet that he will have to provide care for wounds and the infections that sometimes accompany them. Asthma, hypertension, and a suite of aches and pains are also likely to be reported by clients who would not otherwise have such convenient access to medical care. Living outside or in precarious housing is, understandably, hard on the human body. As Dr. Ryan succinctly puts it, "eyes, feet, and skin." These are what suffer first and the hardest when pitted against the elements. Shoes and socks are among the most important items given out by the Street Medicine van. Opioid addiction is a dimension of homelessness in Chicago that requires medical treatment and prevention efforts. And so while Dr. Ryan completes his work, Milton readies harm reduction kits. These kits include clean syringes--often referred to as "rigs" on the street--and the associated supplies that allow for safe and sterile intravenous injection. Separate kits include doses of Narcan (naloxone), an injectable medication which blocks the effects of opioids, and can potentially save a life in the event of an overdose. The January 2017 Point-in-Time Count and Survey Report conducted by the the City of Chicago's Department of Family and Support Services found that 5,657 Chicagoans were homeless, with 1,561 persons designated as unsheltered. As one might expect, unsheltered persons are often the most difficult to locate, and they are often in greatest relative need of health care and social services. The Night Ministry launched Street Medicine as a pilot project in 2015, recognizing the potential value of a highly mobile team of professionals--social workers and health care providers--who could identify homeless communities and build relationships with them over time. These relationships would then have the possibility of enduring as communities moved in response to a variety of factors. In 2018, Street Medicine became a permanent part of The Night Ministry's Outreach and Health Ministry Program. The van typically heads out 5 times a week, to visit both known communities and to identify new ones in need. 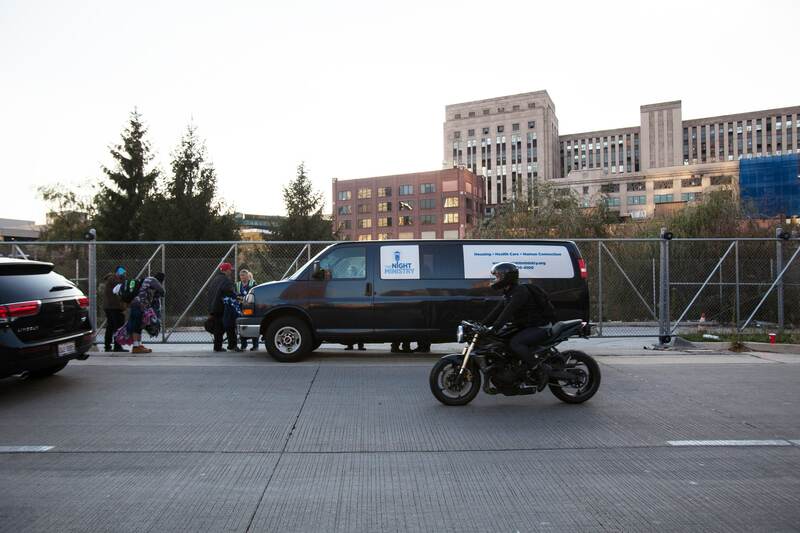 As noon approaches, the Street Medicine van rolls to a stop near the Eisenhower Expressway, where a pocket of shaded green space amid the bustle of cars would surprise a first-time visitor. The established community here is familiar with the Street Medicine program, and several residents respond to the team's greetings with a warm welcome. Food, water, hygiene kits, and socks are widely distributed. Outreach Professional Milton Alvarez chats with a client about how he can obtain a state-issued identification by using The Night Ministry HQ as his mailing address. That ID is often essential for gaining access to benefits and work opportunities. Dr. Ryan examines a resident who was injured in a bicycle accident and is recovering from a significant surgery that left dozens of stitches in his upper chest. Another client, who suffers from asthma, is given a brief physical exam. He accepts an inhaler. There is antifungal cream for a case of athlete's foot. And ibuprofen for back pain. And there are band-aids and alcohol wipes for everyday scrapes. Amid the care and counsel, there is conversation and storytelling. And after nearly half an hour, handshakes and farewells. The crew climbs into the van. Time to get back on the street.